Mr. Bean orders a takeaway pizza, but when it arrives he feels let down by the size of it. A dodgy cabbie thinks he can take Bean for a ride. Mr. Bean wants a smart phone but they are too expensive - especially when you can build your own! How many episodes of Mr. Bean: The Animated Series have you seen? Meet this curious polar bear that travels around the world learning about us. If anything can go wrong for him - it will go from bad to worse. 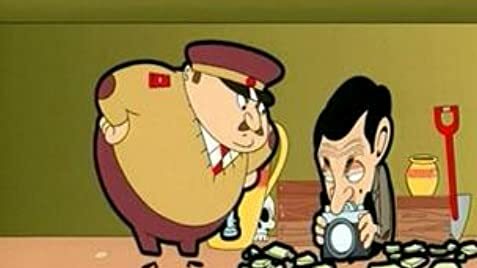 Based on the popular British skit comedy "Mr. Bean", this animated cartoon follows the adventures of everyone's favourite bumbler. 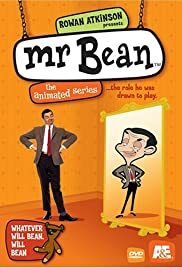 The title character, voiced by Rowan Atkinson, lives in his flat with the lovable Teddy, where he makes moronic decisions yet brilliantly solves them. However, he also needs to outwit his evil landlady Mrs. Wicket and her horrible one-eyed cat Scrapper. Written by Bloggers! I absolutely love this cartoon. I love the live action series as well, and I'm delighted that this animated version captures the essence of the originals. I'll start off by saying the animation style is brilliant. Very refreshing. Kind of a retro style with regards to the simplified backgrounds. Really nice colours. The trees are like the ones in Looney Tunes or Pink Panther cartoons. The characters are superbly drawn, capturing the rubbery facial expressions of Rowan Atkinson. I like the heavy outlines on the characters to set them off from the backgrounds, and I find it amusing that their feet aren't attached to their legs, lol. I'm a graphic designer and I'm a sucker for the retro style artwork. And I'm a sucker for anything truly British in nature. Like the live action series, there isn't much talking. But I think it's wonderful that Rowan Atkinson supplies what mumblings there is for Mr.Bean. And you've got to love his horrid landlady Mrs.Wicket when she yells "BEAN" at the top of her lungs. (She makes him do all the house and yard work and her grocery shopping; does she give him a break on the rent?!) The plots are terrific. Most of them are imaginable as plots that could have been done for the live action series. Mr.Bean buys a new sofa, Mr.Bean loses his ship-in-a-bottle, Mr.Bean irritates a mime... problems he causes, but then resolves in in an outlandish way, and sometimes with a bit of vindictiveness. Sure, there are a few that are a bit more "cartoony" like when burglars steal all the teddy bears, or Mr.Bean's nemesis tenant invents a robot, but that's the beauty of animation, and they never carry it too outlandishly far. The DVDs have some nice behind the scenes on the making of this series. The work and care they put into every aspect really shows through. Months of work for an 11 minute episode, 52 episodes in all! I highly recommend this show. It has a hilarious subtlety, and a lovely charm I haven't seen since the Wallace & Gromit movie. But don't get me wrong, I like things like Family Guy and Simpsons as well, so there's room for everything!